Hi friends! Is it really February already?! Are you ready for Valentine's Day?! 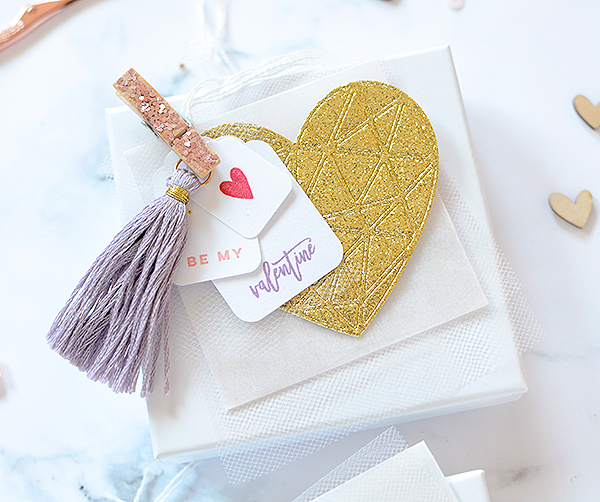 (FYI: There's a kit for that ;) OR you can grab some super-sweet stamp sets from my dear friends over at Winnie & Walter and make your own valentines. They have a big release happening all week. I've seen everything and if you love stamp sets and dies, you will want to check in over there every day to see what's new. 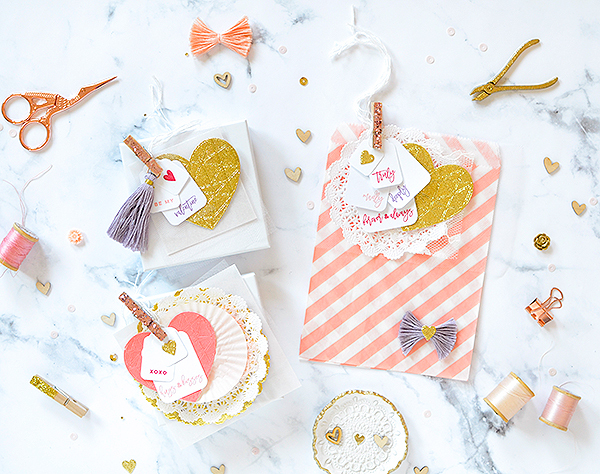 Today is Premiere Day 2 and I'm sharing some valentines I made with a couple of their new sets, Sentimental: Endearments and Sentimental: Love. These are my favorite kinds of sets. 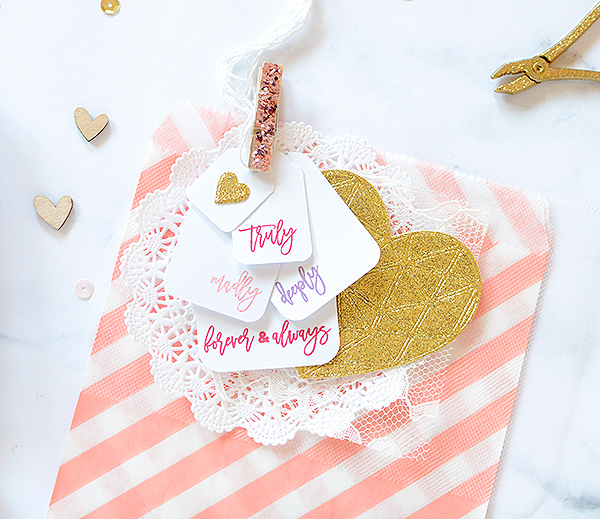 My favorite things to stamp on are little Avery white strung tags and they come in multiple sizes, but they're all fairly small. So small sentiments are the best and these sets by W&W have tons of options and phrases, as well as gorgeous typography. I mainly use my stamped tags on packaging, like what you're seeing here. 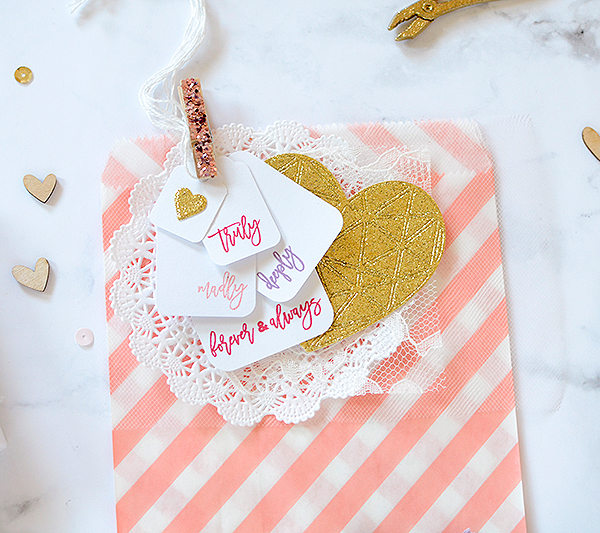 My go-to is generally a layered number--a doily, maybe some lace and/or tulle, a pop or two of bold color, some stacked tags, and most often a glittery clothespin to hold the lot together and attach it to a bag or some trim tied around a gift box. I love this packaging set and while the sentiment 'truly madly deeply' is actually all one line and much too long to fit on one of these white tags, I was able to stamp only one word at a time, masking the others with tape. The large glitter heart was made from American Crafts glitter paper and the W&W True Multifaceted Heart Cutaways. 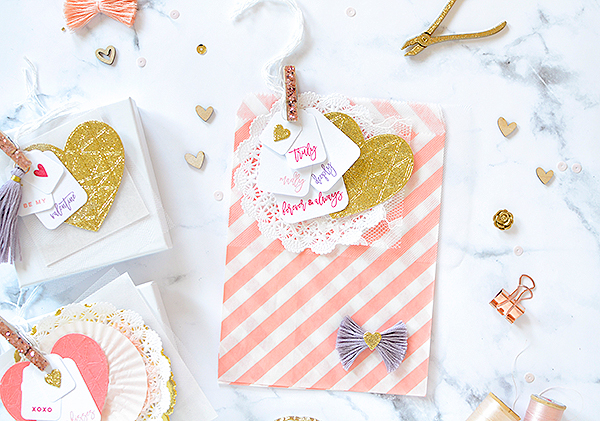 The smaller glitter heart is coming up in Thursday's W&W release! I applied the same idea of the "stacked" tags on the other, smaller valentines, as well. The little red stamped heart in this photo is from another set that is debuting today, called Sending You with Evelin T. Designs. These are absolutely beautiful Rebecca! A great job! 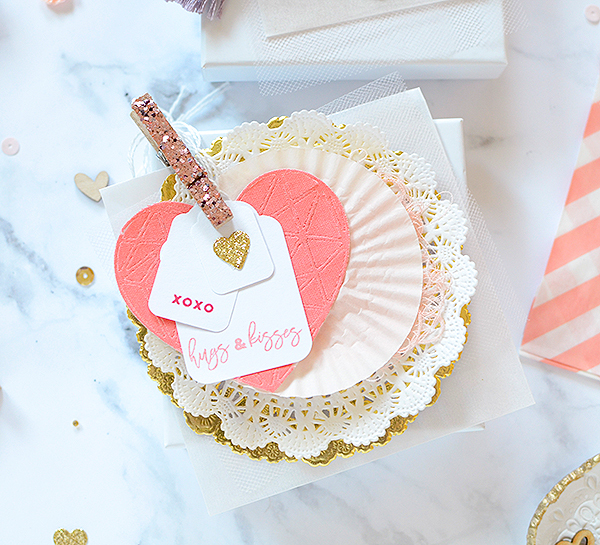 the valentine's day gift wrap kit is here!